A new Intel roadmap was just leaked. 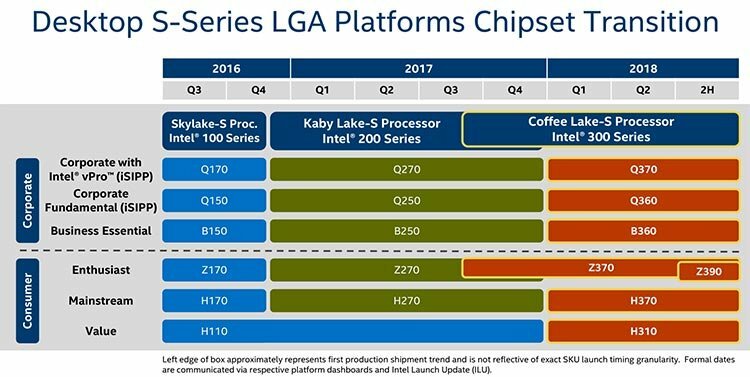 If the chart is real, then we might just have a confirmation of new Coffeelake-S series naming scheme. The B350 chipset, which was already borrowed by AMD, will get a counterpart from Intel as B360. Since there was no successor to H110 chipset with 200-series, the Coffeelake platform will feature an entry-level H310 chipset. The most interesting part is Intel Z390. This is a new high-end chipset for enthusiasts. Right now it’s unclear if Z390 will replace Z370 next year, or if both are to be offered simultaneously, but it may explain why most Z370 motherboards we already saw (thanks to our leaks) were so similar to Z270. The Z390 may simply be a proper successor, while Z370 is just an adoption for Coffeelake-S. The only question is, is Z390 going to feature the same socket?